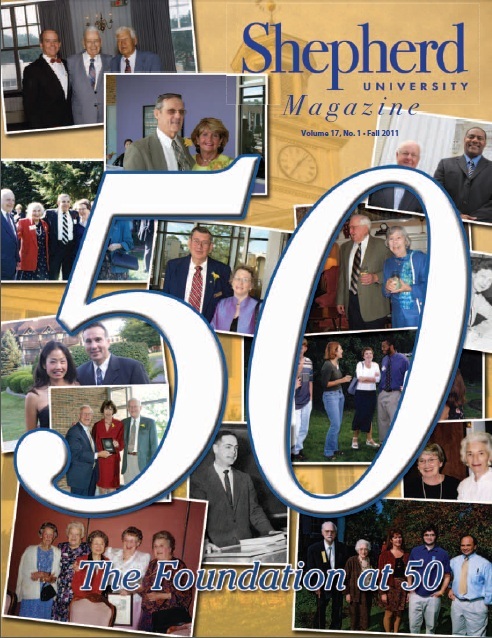 The latest issue of the Shepherd University Magazine (Fall 2011) includes an article featuring Patriot LWM President Joe Brown. You can view the external link to the article HERE or read it below. Joe brown ’08, owner of Patriot Land and Wildlife Management Services, Inc., came to Shepherd in 2001 after he was recruited from his Poolesville, Maryland, high school to play football. He played four seasons with the Rams as an outside linebacker and studied environmental studies and resource management. Joe chose Shepherd because the University offered the degree he wanted to pursue and it was near his family and hometown. He lived for three years during his time at Shepherd at the Sharpsburg Volunteer Fire Department, where he volunteered in the evenings and on weekends. His studies at Shepherd were put on hold twice—once in November 2004 after his childhood best friend was killed in the line of duty in Iraq and again the following spring when he was offered a position with the District of Columbia Fire Department. 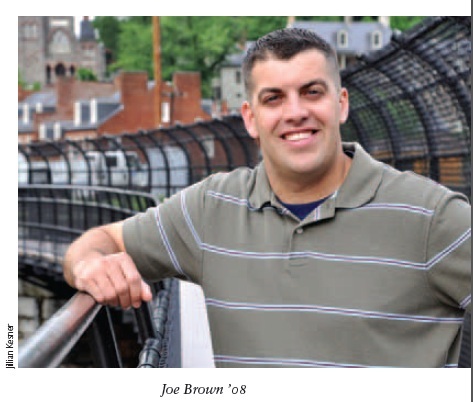 With 12 credits remaining, Joe accepted the position and took classes part-time, finishing his degree in 2008. Patriot Land and Wildlife Management now employs from three to 10 employees through the year, depending on the season. Clients range from private landowners and investment firms to local, state, and federal governments as well as nonprofit agencies and land trusts. His client base has grown by word of mouth. “It’s taken these six years to get the reputation we have, which is finishing jobs that we start. We try to do those extra things that set us apart from other companies,” he said. Joe said that he has been working with the creators of BioHaven Floating Islands to turn them into the best management process and see how they benefit water treatment and how they will impact the future of ecological restoration. “Hopefully we are in on the ground floor of that,” he said. Last summer, a 250-square-foot BioHaven Floating Island, which controls algae and other growth in storm water management ponds and other bodies of water, was installed in Baltimore’s Inner Harbor by Patriot Land and Wildlife Management in partnership with the National Aquarium in Baltimore, the Baltimore Waterfront Partnership, and Blue Wing Environmental Solutions and Technologies. “They’re seeing a lot of big results and hopefully that will lead to some solutions in restoring the Chesapeake Bay through the different tributaries,” Joe said. Joe also is working on a research project with the University of Maryland which focuses on storm water management ponds for poultry farms on Maryland’s Eastern Shore and nutrient management within those ponds. Joe also owns a subsidiary of Patriot Land and Wildlife Management called Patriot LWM Outdoors, which he says is mainly a marketing tool for services and products related specifically to outdoors recreation and hunting. Patriot manages just over 5,000 acres in Montgomery and Frederick counties in Maryland. The first company Joe started in 2004, Black Dog Guide Service, which he co-owns, specializes in waterfowl outfitting service based in Montgomery County. Clients include current and former professional athletes, and the outfitter works to provide free recreational opportunities to injured soldiers and Marines from the Walter Reed Medical Center through Project Second Chance. He still keeps in touch with Shepherd professor Dr. Peter Vila. Joe said he loved learning from him. “He’s been a good resource for me to just check in with him and let him know about what we’re doing,” he said. Because of his ties to Shepherd and a desire to see students afforded the opportunity to find a variety of internships, Joe has recently been working with faculty members to partner with the environmental studies department to provide internships. Since graduating from Shepherd, Joe has continued to serve with Truck Company 17 for the D.C. Fire Company and is also a Captain for the Kentland Volunteer Fire Department in Landover, Maryland. He continues to play football and serves as the general manager for the D.C. Generals, a professional police and fire charity football team. The team plays five games a year with teams from other major cities. All the money raised goes to select charities. 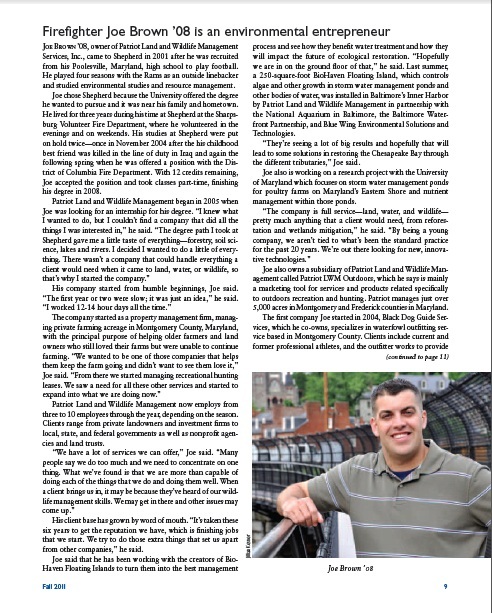 This entry was posted in Aquatics Management, Patriot LWM News, Property Management, Uncategorized, Wildlife Management and tagged aquarium, aquatic management, baltimore, biohaven, Joe Brown, kirk bosselmann, Magazine, news, Patriot LWM, Shepherd University, University of Maryland. Bookmark the permalink.